Accounts Connected To Party Organizations Have Raised Money From Mystery Sources And Used It To Try To Sway Races. On The Democratic Side, The Accounts Have Repeatedly Intervened In Gubernatorial Primaries. LANSING (March 7, 2019) — History repeats. Sometimes in Michigan — a state that’s been ranked last nationally for transparency — the repetition involves hundreds of thousands of dollars in mystery campaign money. 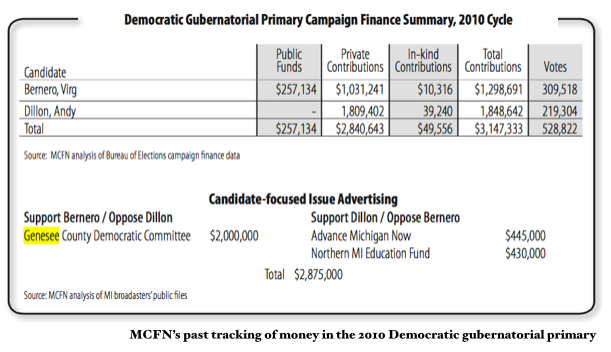 In 2002, an account tied to the St. Clair County Democratic Party spent an estimated $1.8 million on TV ads backing Democrat David Bonior’s bid for governor in a competitive primary race. Sixteen years later, in 2018, it was an account tied to the Ingham County Democratic Party that gave $300,000 to an organization that ran ads backing Democrat Gretchen Whitmer for governor in another competitive primary race. The same account later gave $1.8 million more to a different organization that backed Whitmer in the general election. Neither county party account had to disclose any information about where the money came from. 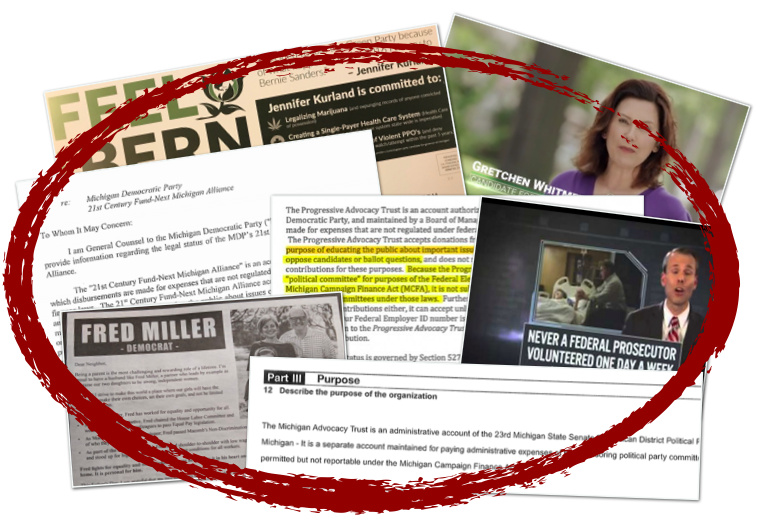 For years, party-connected organizations in Michigan have used legal loopholes to take millions of dollars from undisclosed sources to fund TV ads and mailers that benefit candidates in competitive races, according to a joint investigation by The Detroit News and the Michigan Campaign Finance Network (MCFN). The party organizations have done it while having to file little-to-no public paperwork about the accounts doing the spending. Both Republicans and Democrats have used the strategy to help influence general election races. Democratic party-connected accounts, however, have more prominently used their special status to intervene in primary races. The same power isn’t available to groups not connected to political parties. Read the report from The Detroit News here. 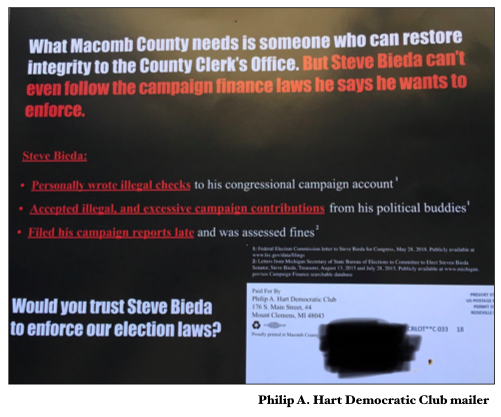 In the summer of 2018, a group called the Philip A. Hart Democratic Club sponsored a series of mailers and newspaper advertisements praising Fred Miller, a Democratic candidate for Macomb County clerk, or bashing his primary opponent, then-state Sen. Steve Bieda. Miller won the primary race by fewer than 3,000 votes, or 3 percentage points. The Philip A. Hart Democratic Club didn’t have to disclose information about how much it spent on the clerk’s race or where the money came from. 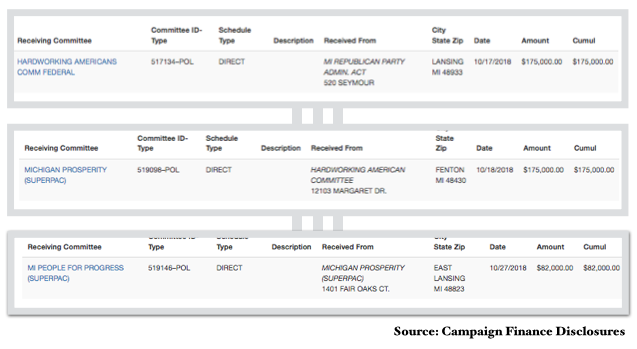 Some Michigan political party fundraising accounts exist in gaps between federal disclosure requirements and state disclosure requirements. Many political organizations fall under Internal Revenue Service filing policies that require fundraising disclosures. However, the IRS requirements generally exempt political action committees (PACs) and political party organizations that usually are subject to state or national campaign finance disclosure laws. The problem is Michigan’s campaign finance laws generally regulate groups that spend money expressly telling people how to vote. This is known as “express advocacy.” So the laws cover advertisements that use words like “support” and “oppose” or specifically name the office someone is running for. But Michigan’s disclosure laws generally don’t cover what’s known as “issue advocacy,” advertisements that talk about issues while also touting or criticizing a specific candidate. The distinction is critical. The state has allowed some political party accounts that aren’t covered by IRS disclosure requirements — because they are connected to parties — to avoid state disclosure requirements in Michigan by spending money on ads that don’t tell people how to vote or other administrative costs. These gaps in disclosure requirements for political party groups or so-called “administrative accounts” have taken shape in Michigan over the last four decades and have allowed for millions of dollars in undisclosed ads about candidates. 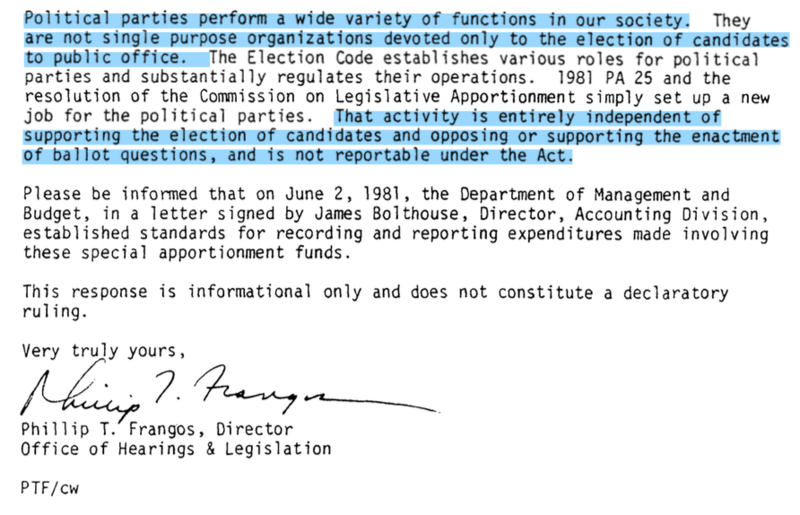 In 1981 and 1982, the Michigan Department of State, which regulates campaign finance, clarified that party organizations could take contributions outside of state campaign finance disclosure laws to influence the redistricting process. The department’s statements differentiated between party spending to directly influence elections and party spending on other “administrative” efforts. In 2007, a Democratic attorney named Andrew Nickelhoff, listed as then general counsel for the Michigan Democratic Party, wrote a letter outlining the status of one such account: the 21st Century Fund-Next Michigan Alliance. He noted that the IRS exempts the “state and local committee of a political party” from reporting requirements. “Based on its usage elsewhere in the (internal revenue) code, the phrase ‘state or local committee of a political party’ includes party-controlled organizations that engage in issue education activities, which are not regulated political committees under campaign finance law,” he said. In 2002, these accounts gained a larger spotlight. An account reportedly connected to the St. Clair County Democratic Party spent about $1.8 million on ads that benefited then-Democratic gubernatorial candidate David Bonior in the primary. The ads didn’t specifically tell people to vote for Bonior, and the party didn’t disclose where the money came from, according to a variety of media reports. The Detroit Metro Times reported in 2002 that St. Clair County Democratic Party attorney Chuck Kelly wouldn’t even say how much the group raised or spent on the ads. MCFN analyzed information on TV ad sales to arrive at the $1.8-million figure. Mark Fisk, then Bonior’s spokesman, told The Metro Times, “It’s an independent group and they do their own thing.” Bonior ended up losing in the primary to Jennifer Granholm. Eight years later, it happened again. A Genesee County Democratic Committee account spent an estimated $2 million on ads benefiting Democrat ] gubernatorial candidate Virg Bernero in his primary race against Andy Dillon. Once again, the ads didn’t expressly tell people how to vote, and the sources of the money behind the ads weren’t disclosed. Bernero narrowly won the primary but lost to Rick Snyder in the general election. Eight years after that, two Democratic accounts, the Philip A. Hart Democratic Club and Progressive Advocacy Trust, gave a combined $550,000 to an organization called Build A Better Michigan that ran ads touting gubernatorial candidate Gretchen Whitmer in her primary race. Neither account reported where the money came from. The Ingham County Democratic Party previously decided to form Progressive Advocacy Trust, but the organization had been given the ability to act outside of the county party’s control, according to three sources within the party who weren’t willing to have their names listed. While it may be somewhat independent, it’s the loose connection to the party that allows the organization to operate in secret. Things are murkier when it comes to the Philip A. Hart Democratic Club. There is a federal-level PAC by the same name but its largest individual expense over 2017 and 2018 was just $14,000. The PAC’s disclosed expenditures don’t include the $250,000 given to the group that promoted Whitmer or any spending on the county clerk’s race. The federal PAC says its PAC is affiliated with the Michigan Democratic Party, but it’s unclear who established the other account. The accounts’ involvement in primary races have frustrated some Democrats who view it as an attempt by party insiders to secretly influence outcomes. Some Democrats, like Alisa Diez, believe party dollars should be focused on beating Republicans. However, many Democratic officials have argued against halting the anonymous spending or “unilaterally disarming,” as some have called it, when it comes to using the accounts to compete with Republicans in general elections. As for whether the state party used county-connected accounts to get involved in primary races, Dillon said while he was chair, the state party never injected itself into primary races. Both parties have frequently used the administrative account strategy in general election campaigns. Progressive Advocacy Trust gave $1.8 million to a group that ran ads promoting Whitmer in the general election. In 2014, a GOP organization with a similar name, Michigan Advocacy Trust, spent an estimated $2.6 million on ads promoting Republican Bill Schuette for attorney general. In 2018, a Michigan Republican Party “admin. act" gave $175,000 on Oct. 17, 2018, to a super PAC called Hardworking Americans, according to a campaign finance disclosure. On Oct. 18, 2018, Hardworking Americans gave the money to another super PAC Michigan Prosperity that sent out $85,000 in mail against Whitmer and gave $82,000 to another super PAC called Michigan People for Progress. Michigan People for Progress then sent out mailers telling people to support the Green Party candidate for governor, Jennifer Kurland, and criticizing both Whitmer and Republican candidate Bill Schuette. Asked about the pro-Kurland mailers, Sarah Anderson, chief of staff for the Michigan GOP, said the Michigan Republican Party would never knowingly support, financially or otherwise, a mail piece that attacked its own candidate. For much of the money flowing to the party administrative accounts, it’s impossible to determine the source. But sometimes, the public gets information through disclosures by the donors themselves. As an example, the Dow Chemical Company voluntarily released reports on its corporate political spending that showed it gave $200,000 to Michigan Advocacy Trust, the pro-Schuette group, in 2014. In 2018, a Michigan Pipe Trades Association political committee reported giving $250,000 to Progressive Advocacy Trust. Over 2017 and 2018, MCFN tracked at least $1 million each in contributions to the Michigan Republican Party’s administrative account and the Michigan Democratic Party’s administrative account. The contributions were disclosed by the donors themselves. They include $1 million that Dow reported giving to the Michigan Republican Party in 2017 and several contributions by super PACs to the Michigan Democratic Party 21st Century Fund. The Democratic Victory Fund reported giving $70,000 on Sept. 25, 2018, and the Future Now Fund reported giving $82,500 on Oct. 5, 2018. Then, there’s bingo fundraising. A handful of local Democratic organizations raise money through weekly bingo events. The Philip A. Hart Democratic Club was licensed to have six bingo events per week in 2018, according to bingo licenses obtained through the Michigan Freedom of Information Act. The club’s federal PAC, which has to disclose its donors, has been reporting raising money through bingo events. Multiple officials with the club didn’t respond to requests for comment over the last year. The Michigan Democratic State Central Committee, another which files reports with the Federal Election Commission (FEC), previously raised money through regular bingo events. However, the FEC penalized the party $500,000 in 2017 for improperly tracking the bingo dollars flowing to the committee. When the Michigan Democratic Party paid $100,000 in July 2017 on its $500,000 federal penalty, the $100,000 check appeared to come from the party’s “21st Century Fund.” The fund isn’t listed in public campaign finance disclosures and the $100,000 payment isn’t listed among the state party’s disclosed expenditures in campaign finance reports at the state or federal level. Judith Ingram, press officer for the Federal Election Commission, said last year that federal statutes don’t address what sources groups may or may not use to pay their fines.